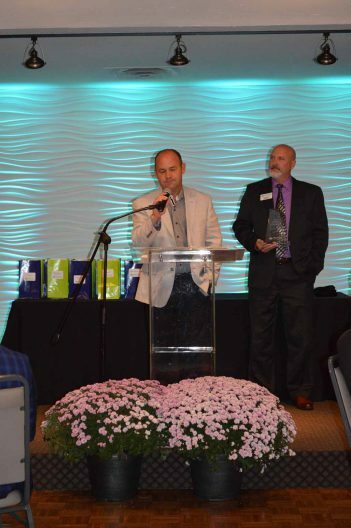 Westfield residents were able to vote on the recipient of the Lantern Award leading up to the Westfield Chamber of Commerce event Sept. 7 at the Palomino Ballroom in Zionsville. The winner, Huston Electric, was announced during the Lantern Awards event. The other Lantern Award nominee was Grand Junction Properties, operated by Bob and Michelle Beauchamp. To be nominated, businesses have to enhance the Westfield community in significant and noticeable ways. Huston Electric has offices in Westfield, Lafayette and Kokomo. It has been family owned for 79 years and most commonly works with electrical contracting. It also has specialty divisions in telecommunications, phone systems, custom signs and lighting, generators and compressors and other technologies. Managing Director of Sales and Service Corky Huston accepted the award and spoke following the announcement. “We are very humbled and honored to be named the award winner for this evening,” Huston said. Huston called Park Street, an effort accomplished largely by the acts of the Beauchamps, an inspiration. “We are very blessed to have landed in Westfield and to have been accepted into this great community,” he said. Also announced during the award ceremony was the recipient for the President’s Award. Established last year, the award allows the chamber president to recognize a chamber board member. Chamber president Nick Verhoff recognized board member Karen Keinsley. “I’ve been in this position very shortly and reached out to the chamber board members and this is the consensus among (Keinsley’s) peers,” Verhoff said. Keinsley spoke on her involvement with the chamber board. Exemplary Employee Award (City of Westfield): Francisco Contreras, who works as a public works administrator/inspector. He also volunteers with the Westfield Youth Assistance Program and is a reserve deputy with the Hamilton County Sheriff’s Office. Serving with an Attitude of Servitude Award (Westfield Fire Dept. ): Chief Garry Harling, who inspects buildings for fire code enforcement. Above and Beyond Award (Westfield Police Dept. ): Instead of recognizing an officer within the WPD, the Westfield Police Citizen Academy received the award. Lt. Mike Seagrave presented it and said the goal of the citizen’s academy is to connect the community with the officers at WPD. Star Award (Westfield Public Works): Pat Leuteritz, who works as a representative with the public works department. Leuteritz was unable to attend, so City Council President Jim Ake accepted the award on her behalf. Shamrock Excellence Award (Westfield Washington Schools): Chuck Abel, who has worked as a transportation employee for 25 years. He was hired in 1993 as the head mechanic and still holds that position. Emerging Leader Award: Andrew Bouse, a sales and service technician with Frontier Communications. He has lived in Westfield for four years and worked in the city for 12. Bouse also is involved with the Westfield Lions Club, the Westfield Arts Alliance, the Westfield Communications Task Group, the Grand Junction Task Group and is vice president of Countryside HOA. Spark Award (New Westfield Business): Chiba Indy, which is owned by Keith Dusko. He founded Chiba in New Orleans and moved to Westfield in 2017. He is working to open a Chiba in Maui. Wick Award (Volunteer of the Year): Tonya Harvey serves on the board of directors for the Legacy Fund. She is active with the Westfield Youth Assistance Program, Student Impact of Westfield and the Westfield Endowment. Prior to choosing to be a stay-at-home mom, Harvey spent 15 years in the medical device industry. Globe Award (Outstanding Service Organization): Trinity Free Clinic, which provides free medical and dental care to low-income Hamilton County residents. Beacon Award (Citizen of the Year): Paul Estridge Jr., president of Estridge Homes. The Estridge family founded the Estridge Family Trust Foundation in 2007, which has since granted more than $6 million to charitable organizations.